My heart cries for the pain of all of the people who are trying to start over and trying to get a good job only to be told by some "human resources" person that we found someone else. They almost never tell you that it is because you have an "arrest" record, but they simply say they found "someone else" more "qualified. Many, many times over the last 20 years people are calling me saying can I get my arrest record expunged and most of the time the answer is "no." But, if you will take the time to write you "state representative" in the Oklahoma legislature and if you seek a lobby or get organized by passing a petition to change the law, then yeah, the law can be changed. You really must be the change in the world you want to see. Voting is only a small part of the formula but a very important part. Lobbying and getting actively involved in supporting your candidate and writing letters to the editor and being a spokes person for "good" is something that the world and your community desperately needs. So, you are just one person. One person can change the world. Jesus, Ghandi, Martin Luther King, etc. For conservatives: Ronald Reagan, Alan Greenspan, Dwight D. Eisenhower, William F. Buckley, etc. You must get involved, write letters, speak out for good. Lobby, organize, let your state representative know who you are. Set up an appointment to talk to your state representative. Show support. Get involved in their campaign. Let them know who you are. Go to church, a church of your choice. Organize. Meet people. Get involved. You might be surprised how many small business people have some kind of minor criminal conviction or record or the like. Start a small business - become your own boss. Go back to school. Go to vo-tech and learn a trade. Some only take about 6 months. Get on the fast track. Making an isolated mistake in life should not make you labeled a "criminal" for the rest of your life. How come the laws in Oklahoma fail to recognize this fact? What can you do to help us change this unfair law? A person should be able to get their arrest record expunged upon completion of a "deferred" sentence automatically. Lobby your legislature and write a letter to your representative. Most politicians have email addresses and you should be able to email their office. You would have more influence if you scheduled an appointment to discuss the matter with them and if you got actively involved in their campaigns so they know you on a first name basis. Politicians are sensitive to the public and to respectible people who engage them in issues important in their lives. People are embarrassed to admit they have a criminal record and that the law needs to be changed. Most people have made some mistake in their life even if they did not get a criminal record or get arrested and prosecuted for their mistake. To err is human. Whether the error constitutes a permanent criminal record depends upon the circumstances. LIVE YOUR LIFE SO THAT YOU ARE MISSED WHEN YOU ARE GONE!!! Any employer or anyone else doing a record check will still show an “arrest” and some people may refuse to hire you because of an arrest record. Some people are “fair” and some people are not “fair.” If your case was dismissed, it is not fair for someone to use it against you but some people will use it against you but not tell you. 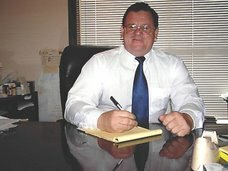 In dealing with employment applications, you may want to list it as an “arrest” and explain that it was “dismissed” because the employer will find out about “arrest” records and if you fail to list an arrest then some people may think you are not being "honest" even though you were not convicted. The statutory laws for Title 22 O.S. 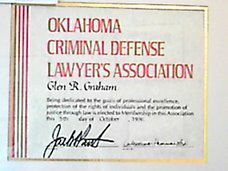 Section 18 and Section 19 may be located on the web by doing a "search" or by going to one of the many web sites that show the statutory laws for Oklahoma such as http://www.oscn.net/ then click on "Legal Research" at the top of that web site and locate Title 22 O.S. Section 18 and Section 19. (1) The current law allows an “arrest” record to be sealed if the case is dismissed less than one (1) year from the date of arrest and if the prosecutor does not object or have a good public policy objection. Currently, the deferred sentences offered by prosecutors are never less than one (1) year from the date of arrest. (2) If the case is dismissed before trial (without pleading guilty) or acquitted at jury trial, then the defendant can hire a lawyer and pay court costs to file a petition to seal the “arrest” record. The prosecutor may object and it would be up to a Judge to decide whether to grant an order sealing the “arrest” record or not but the Judge must follow the statutory and case law. (3) If the case is a misdemeanor offense and results in a conviction, then the statute says after ten (10) years the defendant can file a petition to seal/expunge the arrest record if there are no other convictions and no pending cases. 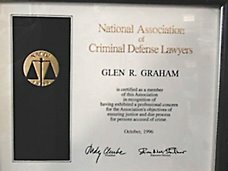 (4) If the case is a non-violent felony offense and results in a conviction, then the statute says that the defendant can petition the Governor for a “pardon” ten (10) years after the date of the conviction if there are no other convictions and no pending cases and then file a petition to seal/expunge. But, that means you have to wait a whole ten (10) years to obtain a “pardon.” Then after the pardon is granted you can hire a lawyer to file a petition to seal the “arrest” record and pay court costs to try to do so. F. The offense was a non-violent felony as defined in Title 57 O.S. §571, the person has no other convictions or pending cases, the person has been pardoned, and at least ten years have passed since the conviction. I plead guilty to a felony in 1996 and it still haunts me today. I prevents me from getting employment, housing and was a huge obsticle I have to jump to attend college. I received 2 bachelors degrees and a masters degree and cannot obtain employment due to the felony. There are some things you might do like using the employment agencies and the "professional" recruiters to assist you in finding a job. Anyone with medical background should be able to obtain a job. There are home health care jobs and other things. One last thing is to consider moving out of state but that may not work if you have a license in Oklahoma. Still, I would STRONGLY encourage you to not give up. You should emphasize the treatment you have completed and show proof of that because many people will be understanding. 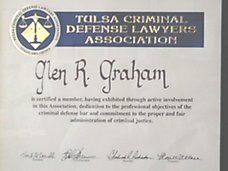 You should seek a pardon from the pardon and parole board the application for it is on their web site: http://www.ppb.state.ok.us/ You absolutely should seek a pardon.